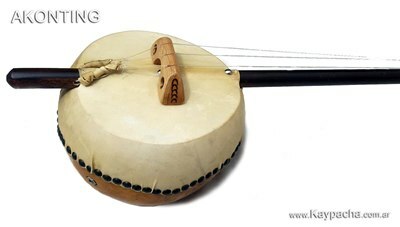 , has three ropes, the body of pumpkin and goat leather, the mast of bamboo or wood, the support of the ropes to the mast is of A simple tie with fishing thread (we adapt wooden or guitar pegs for more precise tuning), the wooden bridge rests on the leather which gives a very interesting sound, is said to be the predecessor of the Banjo , Since it has a sharp and shorter string on the top of the instrument similar to the 5th string of the current Banjo. The Akonting is approximately one meter long. We sell it with built-in microphone and its cover for protection. 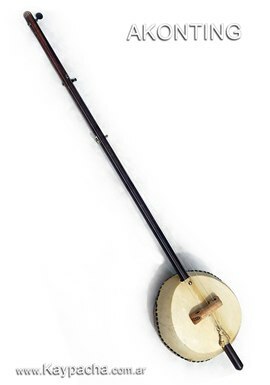 The particularity of this instrument is that the bridge of the strings only supports the leather, which is a feature of the current Banjo and produces a very special sound. 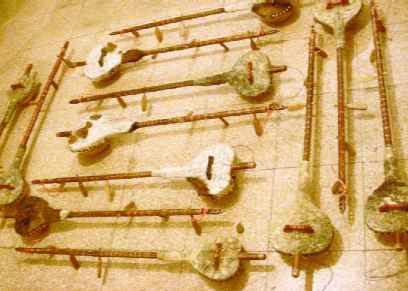 The strings are held from the mast by some leather straps or by a simple tie of the same fishing line of the ropes, we have adapted wooden or guitar calvijas in order to improve the tuning. 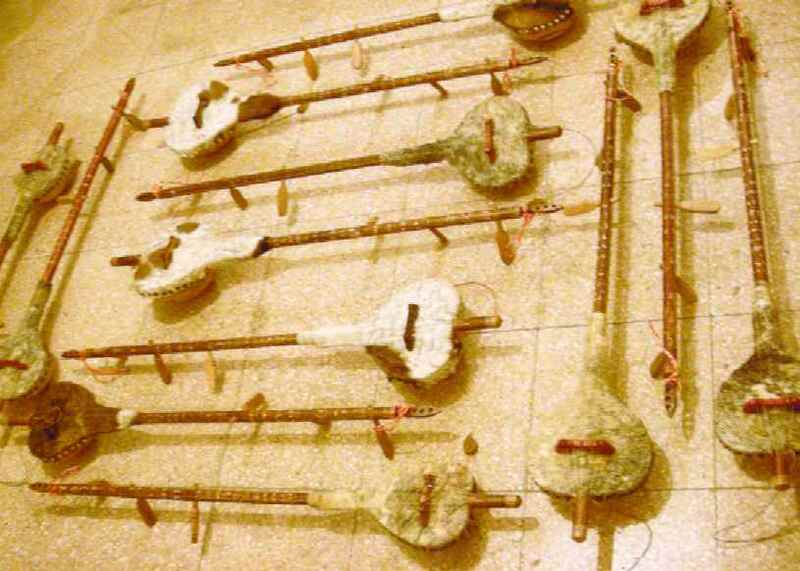 It does not have divisions or marks of frets like in a guitar or Banjo for the different musical notes. 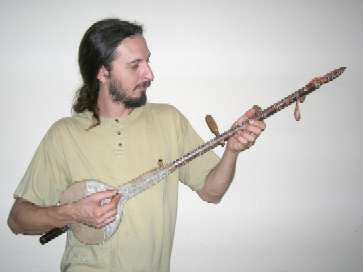 It is executed with the thumb and fingernail of the index finger or middle for the most serious note, similar to the Banjo, the left hand is the one that marks the tones by pressing the strings on the mast to one string at a time. 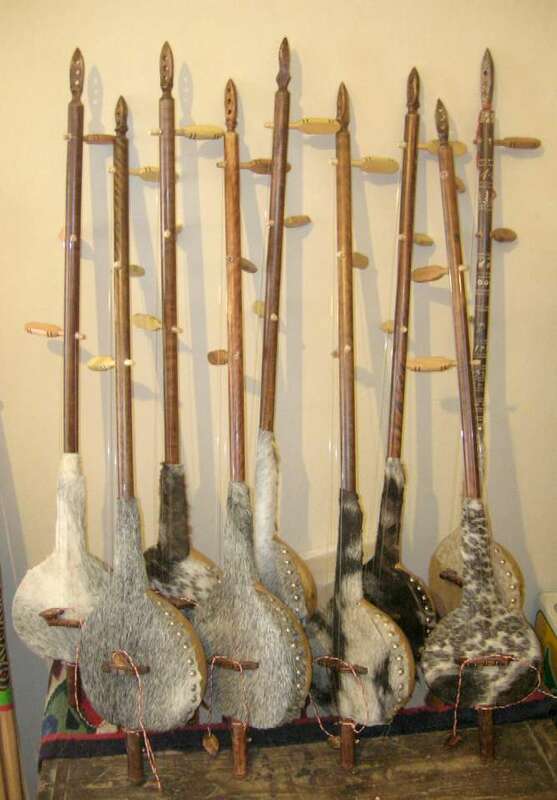 The tuning of these three strings is; The most low in the tonic and is in the lower part of the instrument, the second string is usually the second major or third minor (depends on the geographical region), and the sharpest string that is on the top of the instrument usually Is the seventh minor (in some cases the seventh major, sixth or eighth). For example one of the typical tunings is: B2, D3, A3. - D3, E3, C4-F3, G3, Eb4. Usually performed in Africa to sing or tell stories while playing these instruments. Also to our AKONTING we have adapted counting microphones, which can be adapted to any amplifier. Currently we are selling it with a case for your protection. 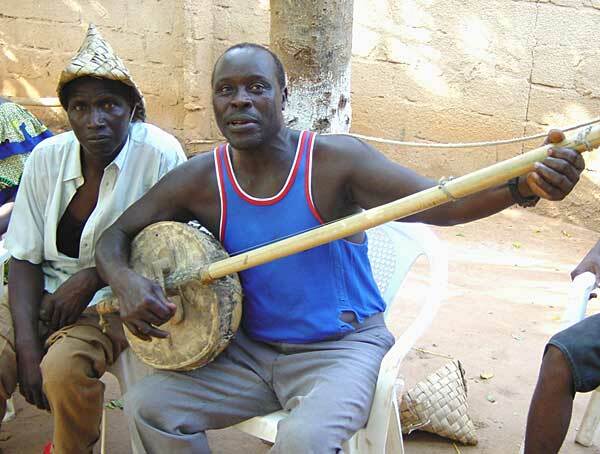 The first inhabitants of the southern part of the Gambia river area were the Jola ethnic group but over time they were mingling with other ethnic groups like Mandigo, Fula, Wolof all with their own languages ? ?and traditions. Portuguese settlers came to the Gambia area after 1455. They disappeared and were followed by British merchants since 1587. They built a fort on the Isle of James, which later became the great port for the slave trade. The slave trade was abolished in 1807. In 1816 Captain Alexander obtained a subsidy from the sandy bank of Banjul Island (Bamboo Island) and built the urban Bathurst and then renamed Banjul. The ethnic group Jola continued during all these years to conserve its way of life. They became Muslims but also saved part of the old African Voodoo religion of daily life. 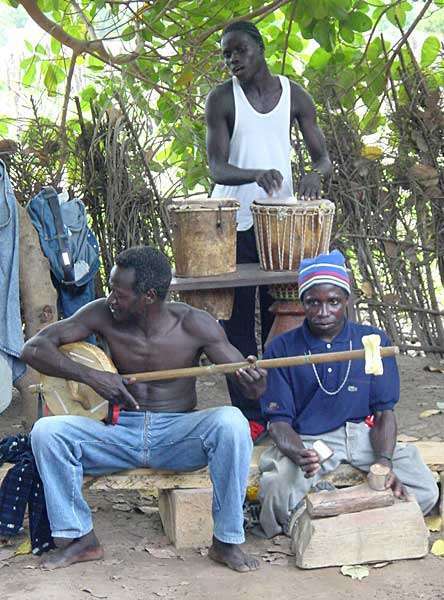 They made and still make palm wines from the Mangrove palm trees, farm arches and dancing and music according to very old traditions. The very typical tradition was that after a work day gathers under a tree Palm, drinks, and play music with the Akonting and Bugarabu drums. 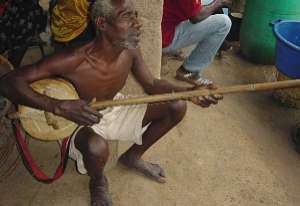 This is contrary to the kind of music played by the Jalis (Griots). And Jalis and Jolas do not mix. The music of the Jolas was really folk music used throughout society. Actualmente hay muy pocos tocadores de Akonting. También muy poca gente dentro de los Jolas que sepa sobre la existencia del Akonting y mucho menos haber oído uno siendo tocado. 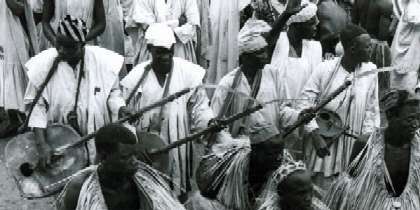 The Jalis Griot in the French or Jeli (pr. Jalolu) seems to have retained in generations their history and genealogies of various clan and families. Composed and sung songs refer to major figures in their history. This ethnic group is mixed with the society of Senegambia and other ethnic groups but not within the ethnic group Jola. 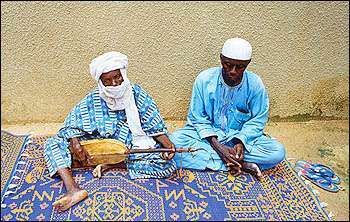 Formally the "Griots" were those who appointed kings and spiritual leaders, they conserve the kingdoms constitutions by memory and work, and are among the Griots kings who chose tutors for young princes. It was a very hierarchical society of Africa before the colonization, where everything is in its place, Griot appears as one of the most important of its society, because it is he who organizes and manages the customs records, traditions and governmental principles of the Kings. In modern Senegambia some of the families of musicians are Griots, but there are also more and more young Senegambians from other sides becoming musicians with the same instruments of the Griots. 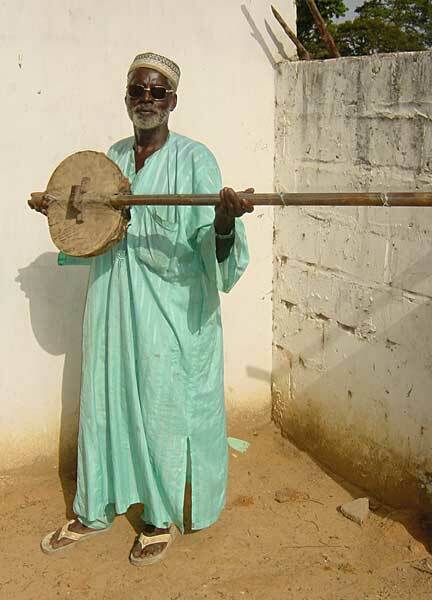 The Griots have between eighteen and nineteen instruments used as The Kora a harp between 19 to 21 cuerdas, the Bala and the Koni (Xhalam, Kontingo) a leather lute between 3 to 7 cords, and other instruments very developed and very common on the region of Senegambia. 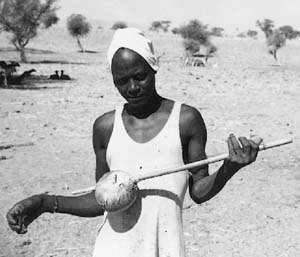 - Koni, Xhalam, Ngoni, Kontingo; Which have a short peg or leather to support the ropes, with the body like a wooden oval dug. Also very similar to the Molo and Gurkel. 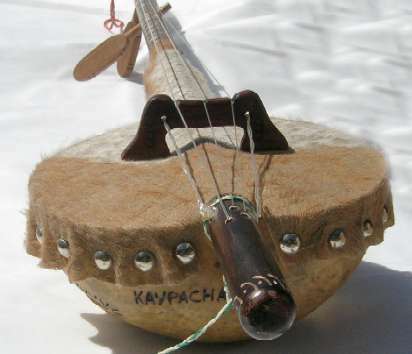 - Molo, Konde and Kabula also with short pegs or strings supported by leather straps, with the round body of pumpkin. 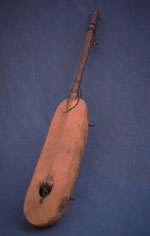 - Akonting with pegs or leather straps To hold the ropes, wooden mast, with a gourd body. 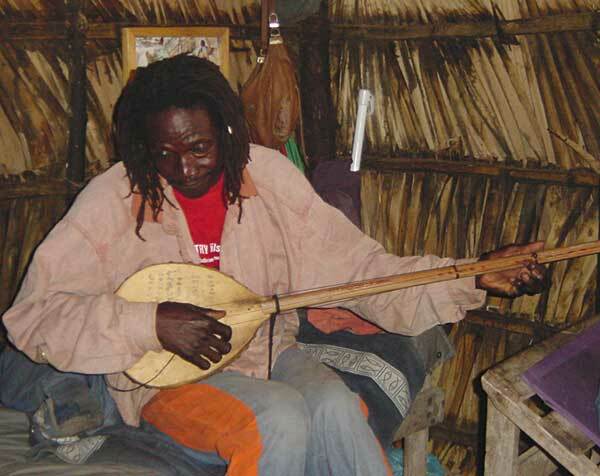 - Harp like the Kora (an instrument of the Griots) and the Simbi, Ngoni, Donso Ngoni, Kamalen Ngoni all these three folkloric instruments of hunters will not be discussed here. They have also passed throwing the pumpkin body peg sticks but they are all played like harps. 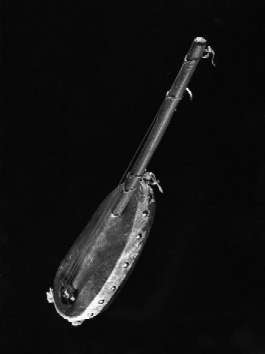 In most lutes the bridge rests on leather, this is very typical and ancient, can be found in similar instruments in ancient Egypt and the Middle East. Another peculiarity is that the strings are born of diverse distance with respect to the bridge. 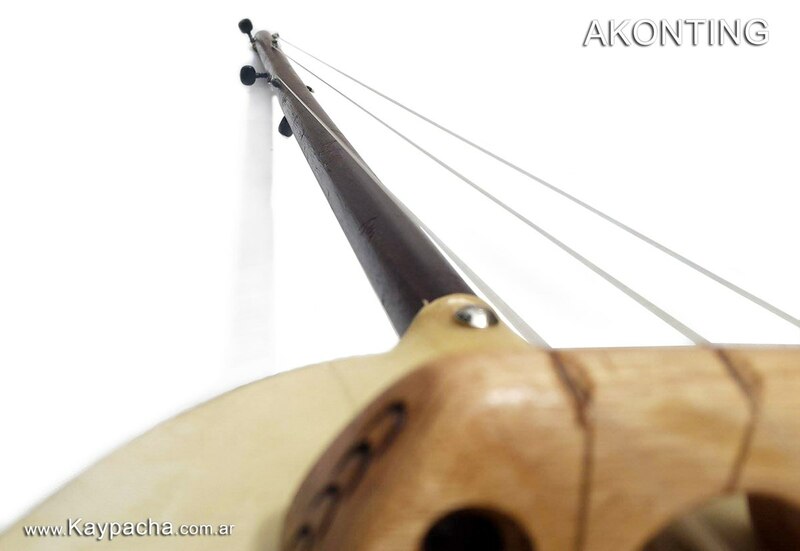 The Akonting is built in a different way. 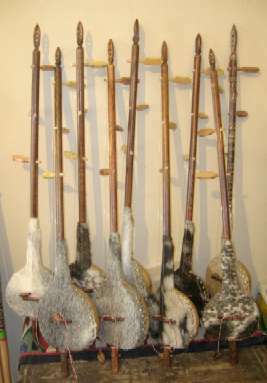 The mast consists of a round surface of about an inch of bamboo or wood. - The body is a pumpkin. - The mast holds the ropes at different distances. - The bridge rests On goat leather. 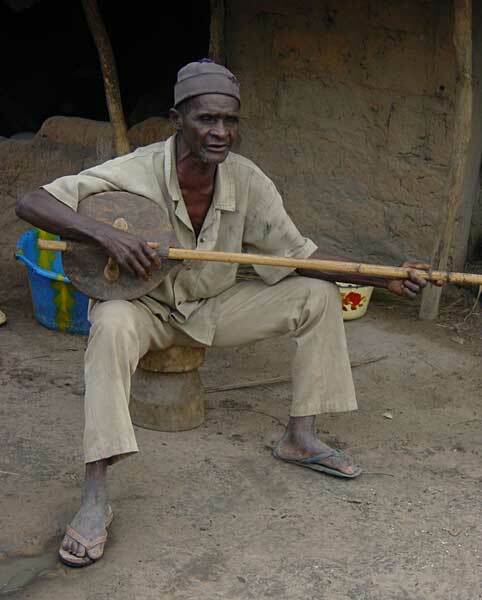 These are the big differences between Akonting and other type of lute instruments in the Senegambia area. 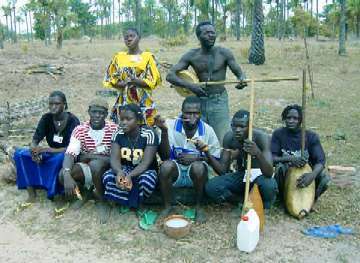 Al Akonting is found in isolated villages of Jola, mostly in the Casamance Southwest area from the capital city of Banjul in Senegal. The Akonting has been changing over time, that is why you can find Akonting with pumpkins of various shapes and sizes from 10 in. To 15 in. In ancient times they used the stomach part of a small lizard that lives in the River area of ??Gambia. Later they used the leather of a very rare animal (it was very good at snatching chickens). The leather was stuck with a few wooden clubs but today they use metal nails. Construction has changed very little over the years. The only difference is that it has become larger in body size, from 8-10 inches to 15 inches. The mast consists of an approximately meter long bamboo or wood with an inch in diameter. The three strings start from the mast near the pumpkin and cross the bridge at the same distance, but end in three different length measures. The bridge resting on the leather and almost in a center of the pumpkin. It was formerly built in hard and heavy woods. 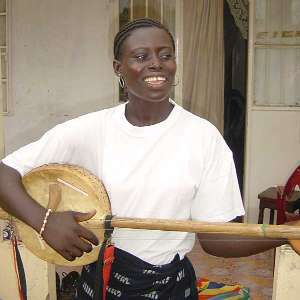 The strings are currently made of nylon but in the past they used strings made from fine strands of a palm tree root, the same as they make palm wine. There are several types of tunings, usually tuned for a pentatonic scale and at the height of the voice with will be sung, the tonic of the pentatonic scale is the most severe string (third lowest string of the instrument) in the air, the second Note of the pentatonic scale is the second string in the air that is typically tuned in a second major or third minor to the tonic, then the next two notes of the pentatonic scale is achieved with the support of the index finger and then the ring Left hand squeezing the most serious string against the mast, and finally the highest note being usually the seventh minor of the pentatonic scale. For example: B2 (lowest note of the 3rd string to the air), D3 (is the second string to the air), E3 and F#3 (of the pentatonic scale are achieved with the bass string pressing with index and thumb respectively Of the left hand on the 3rd rope against the mast), and finally the A3 achieved with the 1st rope in the air). 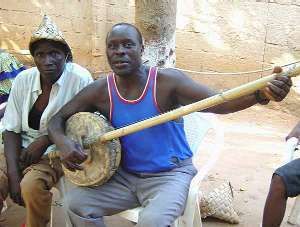 They tune the instrument according to their voice as they always run the Akonting to sing at the same time.